P2	P6	P11	P12 What are Natural Resource Charter precepts? NRGI has argued for some time that these physical oil trading transactions merit greater transparency and oversight, for two reasons. First, the sales are economically important. For countries such as Iraq, Libya and Nigeria, oil sales have in past years generated over half of total government revenues. From 2011 to 2013, oil sales by the governments of Africa’s top ten producers totaled USD254 billion, an amount equivalent to 56 percent of those countries’ total public revenues. Second, as with other high-value transactions in the extractive sector, the sales are susceptible to corruption. 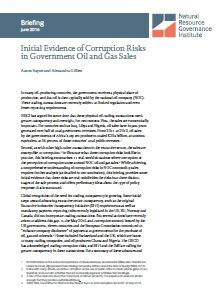 To illustrate what these corruption risks look like in practice, this briefing summarizes 11 real-world situations where corruption or the perception of corruption arose around NOC oil and gas sales. While achieving a comprehensive understanding of corruption risks in NOC commodity sales requires further analysis (as detailed in our conclusion), this briefing provides some initial evidence that these risks are real; subdivides the risks into three distinct stages of the sale process; and offers preliminary ideas about the type of policy response that is warranted.